Immigrant advocates use an image of New Mexico Gov. 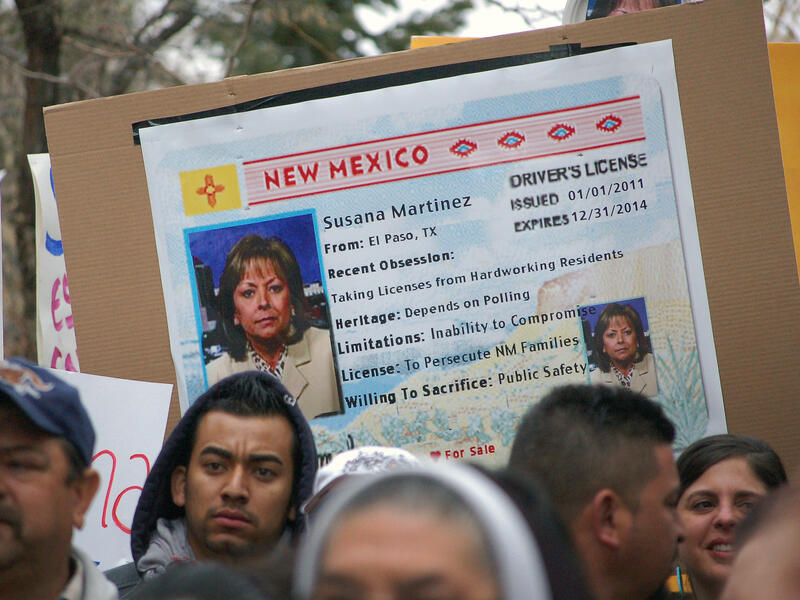 Susana Martinez on a mock state driver's license during a 2012 rally in Santa Fe, N.M., to protest her proposal to repeal a state law that allows undocumented immigrants to obtain driver's licenses. The national debate over immigration may be churning on in Washington, D.C., but there's one policy a growing number of states can agree on: driver's licenses for undocumented immigrants. Vermont, Connecticut and Colorado passed new laws this month allowing drivers without Social Security numbers to receive licenses or authorization cards. They join Nevada, Maryland and Oregon, whose governors signed similar laws in May. Illinois Gov. Pat Quinn started the trend this year when he signed Senate Bill 957 in January. The recent wave of state laws reflect an about-face in policy after 9/11, when states tended to enact more restrictive licensing requirements. In recent years, undocumented immigrants have been able to receive driver's licenses in Washington state and New Mexico; and in Utah, drivers who cannot "establish legal/lawful presence" can apply for driving privilege cards, according to the Utah Driver License Division's website. The types of licenses that undocumented immigrants can receive vary by state. Nevada's law follows Utah's model by only allowing driver's privilege cards. Such limitations prevent undocumented immigrants from using the cards as valid government-issued identification. These new state laws show that the public safety argument often cited by immigrant advocates is "starting to carry weight," says Ann Morse, who directs the National Conference of State Legislatures' Immigrant Policy Project. ...unlicensed drivers are almost five times more likely to be in a fatal crash. They are also less likely to stay at accident scenes, according to Yale Law School's Jerome N. Frank Legal Services Organization. The costs of accidents involving the uninsured are passed on to other motorists in the form of higher insurance premiums. Not all states, however, have found public safety concerns compelling enough to grant licenses to drivers who are undocumented immigrants. As NPR reported, some states question whether undocumented immigrants who have received deferred action qualify for driver's licenses. Young immigrants with deferred action have entered the U.S. illegally as children and are granted the right to work or study and avoid deportation for two years through a program called Deferred Action for Childhood Arrivals. Florida Gov. Rick Scott recently vetoed a strongly supported bill that would have allowed young immigrants with deferred action to apply for temporary driver's licenses. Nebraska and Arizona also deny licenses to immigrants with deferred action. New Mexico Gov. Susana Martinez has repeatedly called for her state to stop issuing licenses to undocumented immigrants. The state, which has issued unrestricted driver's licenses since 2003, has seen a number of identity fraud cases, The Wall Street Journal reported. California, Texas and Minnesota are among other states this year that have introduced bills on licensing for undocumented immigrant drivers. Whether or not undocumented immigrants should be able to apply for driver's licenses will be up for debate at least until Congress passes an immigration overhaul proposal.